Doctors say that one of the major problems with new mothers is postpartum depression. Unfortunately, most women try to keep this condition a secret, and this could lead to devastating consequences for both mother and child. Having a baby is stressful and puts you through physical and emotional changes. Considering the sleep deprivation, new responsibilities, and lack of time it's only natural that a lot of new mums feel like they're on an emotional rollercoaster. The types of postpartum depression depend on the severity, ranging from mild baby blues to postpartum major depression to postpartum psychosis. Baby Blues is a term used to describe a self-limiting, relatively mild type of depression experienced by the new mothers. Symptoms include moodiness, anxiety, sadness, crying spells, insomnia, and fatigue. Baby blues usually begin 3 to 10 days after childbirth and end within two weeks. 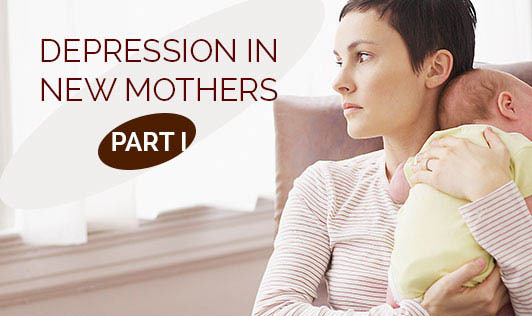 Postpartum Major Depression tends to develop three or more weeks after delivery. Mood symptoms are more severe and last longer. Symptoms may include crying spells, poor concentration, difficulty in making decisions, sadness, and feelings of inadequacy. Physical symptoms similar to hypothyroidism -- such as sensitivity to cold, fatigue, dry skin, slowed thinking, constipation and fluid retention -- may also be experienced. Postpartum Psychosis, sometimes called peurperal psychosis or postpartum psychotic depression begins within the first two weeks of giving birth, although a second peak has been observed to occur one to three months after delivery. Postpartum psychosis may be preceded by worsening insomnia, agitation, confusion, memory problems, irritability, and anxiety. Symptoms of postpartum psychosis include intrusive thoughts, delusions, hallucinations, and inappropriate responses.